ArtPlace America and the US Water Alliance share the conviction that arts and cultural strategies have the power to move the needle on One Water—an approach to managing our nation’s water resources in an integrated, inclusive, and sustainable manner to secure a bright, prosperous future for our children, our communities, and our country. While promising, efforts to integrate arts and culture into the field of sustainable water management is nascent. To accelerate these efforts, ArtPlace and the US Water Alliance are partnering to catalogue successful examples and clearly demonstrate how the integration of arts and cultural strategies have resulted in improved water management outcomes or put stakeholders on the path to positive results. Building upon ArtPlace’s research report Farther, Faster, Together: How Arts and Culture Can Accelerate Environmental Progress and the US Water Alliance’s One Water Roadmap, this collaborative effort will both make the case—and expand the body of evidence—for how multi-sector partnerships around arts and culture can contribute to a sustainable water future for all. With support from a cross-sector Advisory Group and Helicon Collaborative, ArtPlace and the US Water Alliance created an action-oriented resource that was released at the at the US Water Alliance’s One Water Summit in the Twin Cities from July 10-12, 2018 -- the premier water industry leadership event, attracting water utilities, water reliant businesses, environmental organizations, community leaders, researchers, and many others. We have also supported a delegation of arts and cultural leaders to attend the One Water Summit, and an in-depth learning workshop for summit attendees. The US Water Alliance recently released its newest publication, Advancing One Water Through Arts and Culture: A Blueprint for Action. In partnership with ArtPlace America, this action-oriented blueprint presents a framework outlining how water sector leaders and artists alike can engage in cross-sector collaboration to advance common goals. The report catalogs the best and brightest models and partnerships using arts and culture to advance One Water management, complete with in-depth case studies. This partnership builds upon ArtPlace's Farther, Faster, Together: How Arts and Culture Can Accelerate Environmental Progress, as well as the US Water Alliance's One Water Roadmap and An Equitable Water Future. Read the blueprint. In September 2016, ArtPlace commissioned Helicon Collaborative to lead research to better understand how creative placemaking is advancing sustainability outcomes for communities. Helicon’s research process involved a literature review of over 500 academic and non-academic sources; analysis of over 100 environmentally related art and culture projects across the United States; in-depth interviews with 37 field leaders; and a working group of 26 people convened in partnership with Grist and the Sierra Club. 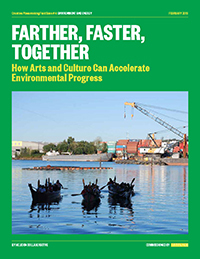 Download the full field scan, Farther, Faster, Together: How Arts and Culture Can Accelerate Environmental Progress, to learn more. The exodus of coal companies has caused widespread economic and social devastation in Appalachia. The rapid and near total loss of its primary employer, albeit one that caused significant health and environmental damage, has left the region facing the challenge of how to move forward and create a viable future. What to do next is not obvious or easy, especially in a community that has been so defined by its relationship with coal, and starkly divided between industry supporters and opponents. Artists and organizers Bob Martin and Carrie Brunk moved full-time back home to Kentucky in 2011 in the midst of this transition. 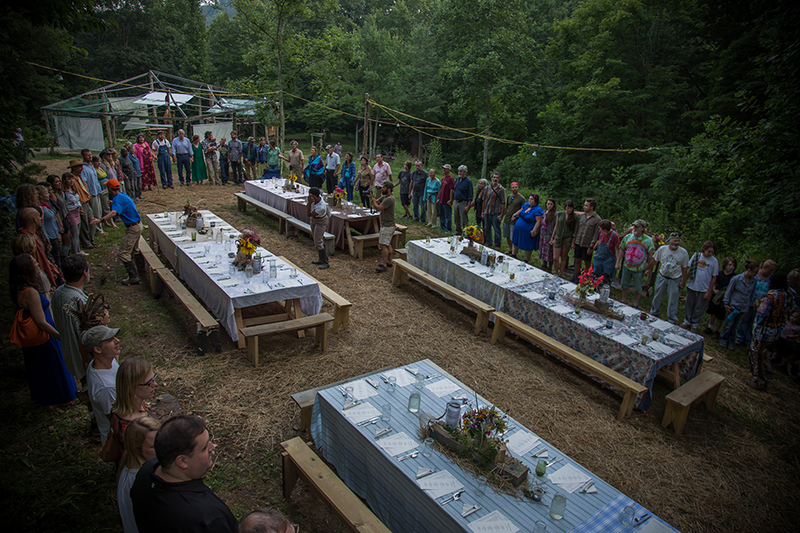 They took over producing the Clear Creek Festival, a community gathering around art, music, food, and storytelling in the foothills of Rockcastle County, KY. The festival was small in the beginning, but each year they attracted a wider range of people to come together around culture. By starting with something that everyone shared, regardless of political or ideological perspective, they hoped that people might be able to engage with one another and heal some of the long-standing divisions. In the winter of that year, “land men” showed up in the region, hoping to buy land cheaply and sell it to energy companies for natural gas exploration, a well-worn strategy in poor regions. Brunk says, “Whether they were drawing on the history of this region’s largely compliant relationship to extractive industries or whether they were just counting on people who mostly don’t have a lot of money being willing to do anything to get some, they figured it was a safe bet that many would just sign.” But many in the community had just spent the last year talking about their relationship to the land and what they wanted for their future, and they knew that a new extractive industry was not what they wanted. Moreover, the trust and social networks that had been built allowed information about what was going on to spread quickly. The community created a plan of action and a network, Frack Free Foothills, to stay informed and organized. 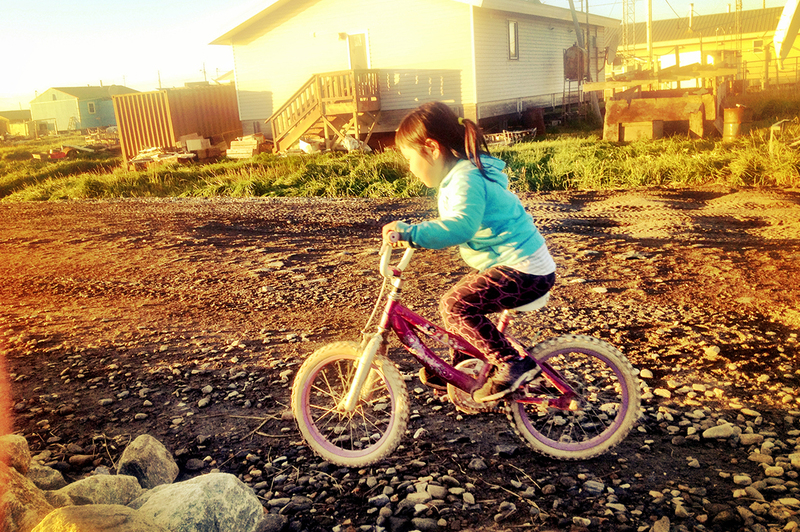 The Inupiaq in Kivalina, Alaska, are facing the imminent need to relocate their village. Traditionally semi-nomadic, the people of Kivalina were forcibly resettled by the U.S. Government onto a barrier island 100 years ago. The barrier island was ill-suited for habitation from the start, and the community has long struggled to relocate in order to access proper water and sanitation infrastructure, deal with overcrowding, find economic opportunity, and escape the erosion of their built environment. The coastal erosion is being accelerated by climate change, which compounds the effects of all of these issues and is increasing the urgency of relocation. For decades, Kivalina has fought for relocation through the U.S. courts and political system. Yet despite many official studies confirming the necessity of relocation and government-generated plans to do so, there has been limited government authority and insufficient political will to allocate the resources needed to make relocation happen. Re-Locate Kivalina is team of artists, architects, environmental justice lawyers, anthropologists, and others working in partnership with community members to help them envision and create a plan for relocation that not only keeps the community physically safe, but also sustains their cultural traditions. One important piece of this is selecting locations for their new village development where Kivalina people can continue the cultural practices that support their particular way of life. The project also includes an online archive where the community is documenting and sharing the history of its fight for relocation and its ongoing navigation of colonial power and bureaucracies. Now, in addition to working through the U.S. political system, Kivalina’s relocation leaders are skillfully using media to attract global attention and allies. As a result, Kivalina has become “an international icon of climate-related displacement and change,” according to participating artist Michael Gerace. By making their process visible globally, Kivalina’s approach to community led and culturally informed planning can be instructive for the growing number of frontline communities seeking their own creative solutions to addressing climate change’s impacts in ways that protect their culture. In partnership with Kivalina’s relocation leaders, the Re-Locate project team is now working to find ways to unlock new resources for relocation, contribute to the global dialogue around climate-related displacement, and form global networks of allies to support Kivalina and other frontline communities. Current non-local allies of Kivalina include archive developers at the Center for Digital Archaeology (San Raphael, CA), geophysicists from Berkeley Lab (Berkeley, CA), and biochar reactor developers at Biomass Controls (Putnam, CT). Minnesota is the location of the headwaters of the Mississippi River watershed, which drains into 31 states. This means that the need for smart and fair water management is key for the state’s own communities, in addition to many others. There are long-standing tensions among different stakeholders in the state—like urban drinking water districts and rural agricultural producers —which are intensified by climate change, population growth and ideological differences. State government and environmental groups are struggling to increase public awareness of and commitment to responsible water stewardship, let alone bridge these deeper divides. 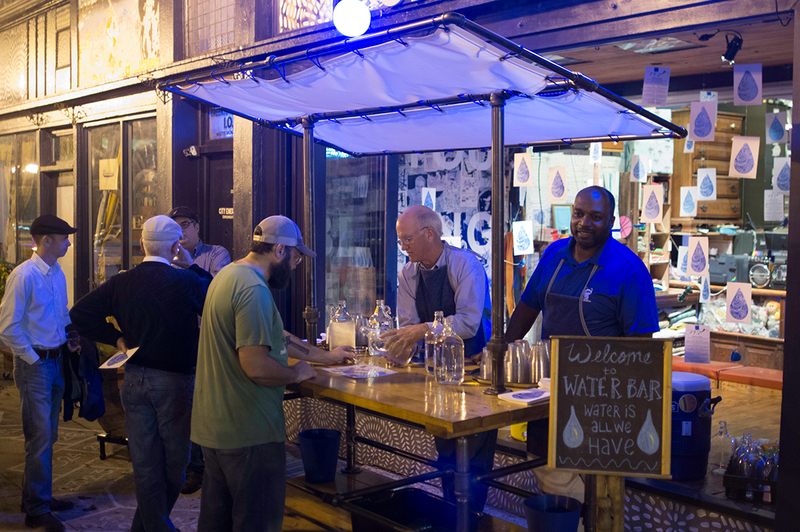 Instead, Water Bar is a free bar that invites people in with a sign out that says “water is all we have.” “Water Tenders,” made up of a rotating cast of public officials, ecologists, activists, artists, and community members, serve water from various sites around the state. The casual, playful atmosphere attracts a range of people, from the curious passer-by to the committed activist, and engenders conversations between people that would not normally interact. Topics range depending on who is in the room -- from water pollution to usage rights to climate-change related issues—but the artistic construct and welcoming space creates a context for truly human connections, regardless of sector, geography, or views. Matteson says, “as artists we can be ambiguous in a way that is fundamentally different from a government agency or an environmental group that has a specific agenda. It isn’t that we don’t have views, but we are not telling people what to think. It is ok if you have questions, or don’t know where you stand on something, or don’t agree.” In addition, because it is “play,” water tenders and patrons can break out of their official roles, often leading to new ideas or collaborations. Cognitive scientists now confirm Matteson’s intuition that getting people to connect with issues and each other on a personal and emotional level is how opinions and behavior are really shaped and changed. Water Bar, like many art experiences, meets people on the level of identity, values, vulnerabilities and emotions. Water Bar is now a sought after resource and creative partner for civic and governmental organizations including the State Governor’s office, the City of Minneapolis Office of Sustainability, environmental organizations, watershed districts, and others statewide as they look to raise public awareness and solve complex water challenges by working across sectors. Water Bar has also become a community hub for artists and community activists looking to form collaborations, and to develop new opportunities to work within broader water systems. The flooding of the Red River has long been an issue for the City of Fargo, North Dakota, and is getting worse with climate change. Over the past several decades the city has built an extensive network of stormwater detention basins to protect the community from water overflows. However, this has created wide swaths of barren, ugly and unusable spaces that have physically separated neighborhoods and marred the city’s landscape. Together, the residents—including Native Americans, Scandinavian-Americans, and refugees from Africa and other countries—began to imagine new possibilities for these spaces. In partnership with the city’s planners and engineers, they designed a series of amenities that included sculptural features, a natural amphitheater, community gardens and festival spaces. These vibrant public spaces will provide social and cultural spaces for the surrounding community, and create new opportunities for interactions among groups that have been physically isolated from each other. The process also helped the community reconnect to water as something that can be life-giving and life-enhancing, not simply terrifying. Integrating stormwater management with living community spaces celebrates water as an essential part of Fargo’s identity and culture. The creative approach to the site has turned out to have some environmental and economic benefits as well. For example, the artists convinced the city to experiment with not mowing the fields in order to see what grew there. Not only was the natural landscape of native grasses aesthetically beautiful, but it turned out that this landscape naturally and efficiently managed invasive species, saving the city money and energy. The project also built knowledge on green infrastructure unique to North Dakota, as Brookner engaged with North Dakota State University and City Engineering to try new approaches. Fargo City Planner Nicole Crutchfield reflects that “By working with artists and using a creative problem-solving lens, we were able to find solutions that functioned on multiple levels--ecological, spiritual, infrastructural, and aesthetic. 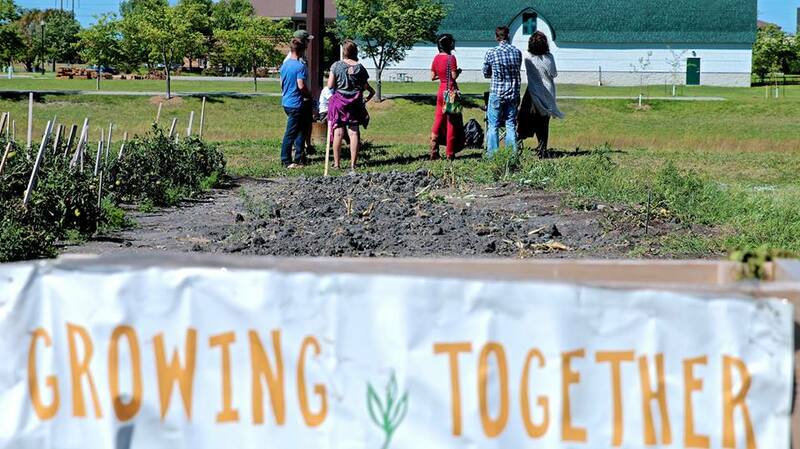 We picked up on nuances about what the community needed and what worked that we would have missed if we had approached it using our conventional planning methods.” Working this way was so successful that the city of Fargo has begun to use artist-led, community-based processes for other infrastructure projects as well. It believes so strongly in this approach that it has created a workbook to help other communities understand why working with artists can generate better solutions and how to do it effectively. The South Side of Chicago is a predominantly African-American community that has suffered from decades of disinvestment and neglect, leading to high levels of poverty, unemployment, and crime. The neighborhood is populated by abandoned buildings and lots, which often remain vacant for years because developers can’t see a “return on investment.” The neighborhood has myriad environmental health challenges that correlate with poverty—lack access to healthy food, burdensome energy costs for low-income residents, un-remediated toxins in buildings and soil, and so on. In 2014, artist and designer Emmanuel Pratt looked at his neighborhood and instead of a tangle of liabilities saw opportunity and underutilized assets. 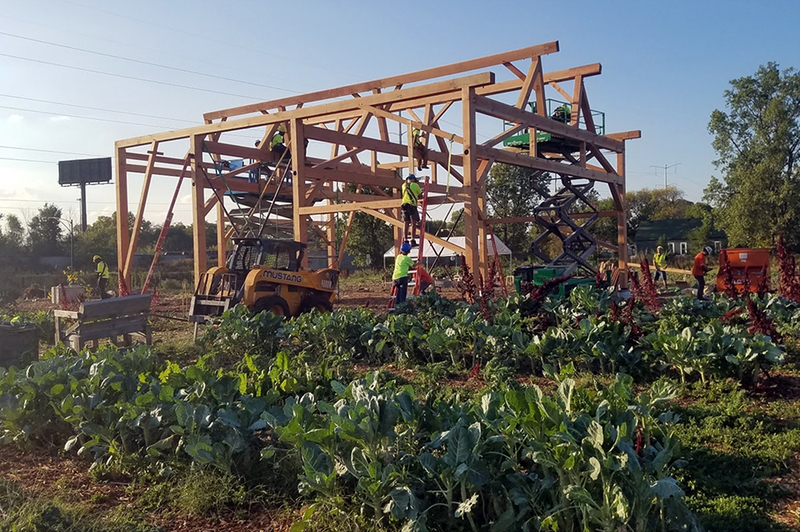 He began working with the community to build Perry Avenue Commons, a series of aquaponic farms, community gardens and art spaces utilizing the vacant lots and buildings and putting people to work. Over the past three years, Perry Avenue Commons has grown to include more lots and houses, and is achieving a range of environmental, social, and economic benefits. The farm helps feed neighborhood residents and supplies Chicago’s locavore restaurants, which have an insatiable demand for its produce. Its aquaponic systems are drought-resilient (enabling them to go up to three days without water), reduce summer heat effects in the neighborhood, prevent flooding, and generate renewable energy, which the farm sells back to the grid. With the revenue it generates it provides paying jobs to neighborhood residents who build and work on the farm and arts integrated, hands-on Science, Technology, Engineering and Math (STEM) education to neighborhood youth, many of whom are high school dropouts or face other barriers to employment. And now the property value of the site, which was deemed to have no return on investment (ROI) by developers, has increased exponentially. The project has reinvigorated a sense of community pride and agency, spurring a number of other improvement projects. Perry Avenue’s has serious environmental goals, but Pratt credits its artistic elements—murals, landscape design, traditional woodworking, festivals and performances, and culinary arts—as the keys to its success. Art creates a welcoming symbol of regeneration and care that draws residents to the site, changes how they relate to each other, and activates a sense of possibility and ownership. The beauty of the site also attracts public and private investments. Pratt says, “The second we activated the garden site through art and culture, not only did vandalism completely disappear, we became an international tourist destination point.” It has been part of museum exhibits at the Art Institute of Chicago and internationally, and its art world validation has made the City of Chicago more supportive. This positive attention to a neglected part of the city helps convince officials to allow activities that are not covered by existing zoning regulations.